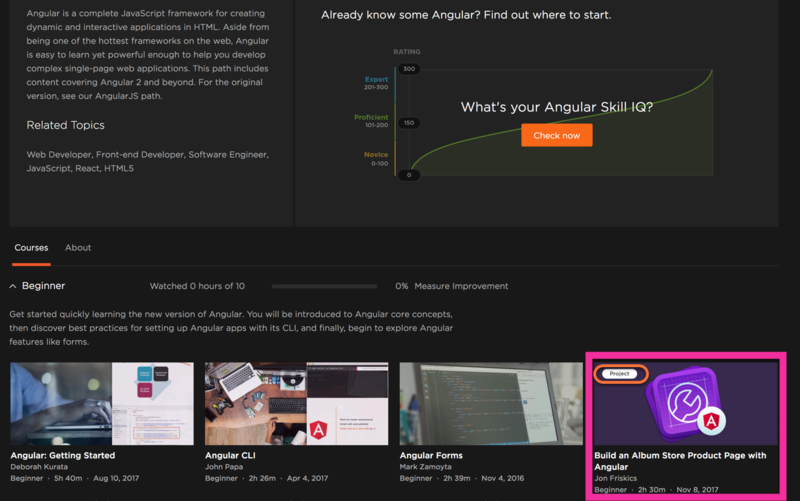 Where can I find Projects on Pluralsight? Important: Projects are available to learners on Professional and Enterprise business plans and individual Premium subscriptions. Projects allows you to use what you learned on Pluralsight and provide you with a hands-on experience on your local computer. As you follow along with a set of provided tasks, you'll be able to build a real-world application. Don't worry - we'll do all the checking for you. You can find a list of all Projects from the Projects page. 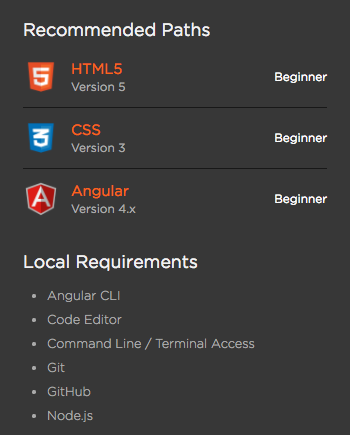 Alternatively, you can find projects within a paths page for a particular skill. Projects can be found as the last item in a beginner tier of course listings. All projects are also designated by the Project identifier in the top-left corner. This helps you differentiate between a course and a project when you're searching for content. Tip: If you're a team manager or admin, you can find a snapshot of teams Projects progress from your dashboard. To locate, find the "Projects" box to see Projects data of your team from the last 30 days. 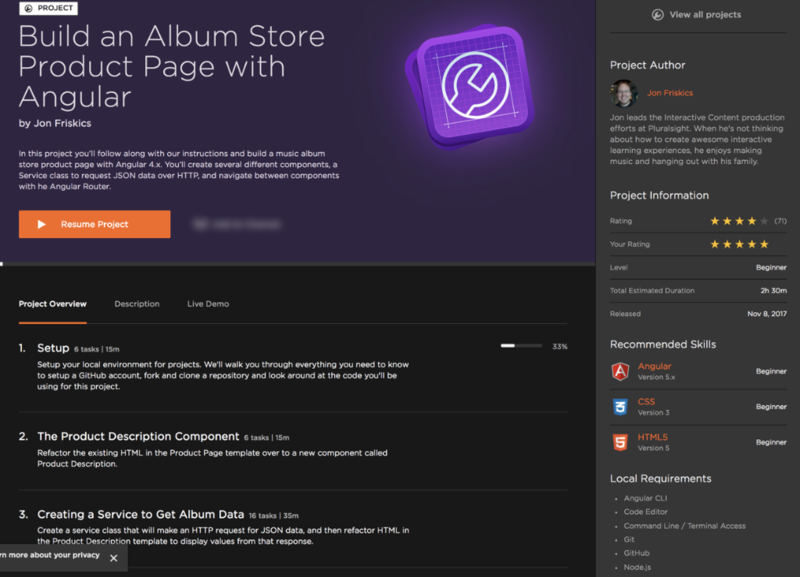 Note: If you have never used GitHub or code editors before, don't worry - we've got your back! Every project has a setup module with step-by-step instructions on creating a GitHub account as well as finding and downloading code editors and setting up all other local tools needed for your Project. Ok! I'm all setup. Now, how do Projects work? All projects have a unique, real-world scenario in mind. These scenarios are built with tasks within a given project. As such, each scenario takes a different approach to solving, creating, and building these projects locally, submitting your code, and letting us check your work. This is all done using GitHub. Don't worry! If you've never used GitHub before, we walk you through step-by-step in setting it up, forking, and cloning a repository. Once you've completed tasks, you will push these changes to GitHub where can then check your code for you. After you're done working through a project, you'll not only have hands-on experience with that technology, but you'll have a local working project that you can keep learning with and expand upon. Most issues with projects involve code submission. If you have an adblocker, such as uBlock or AdBlock, we recommend turning those blockers off as those may inhibit Projects code submissions and use. If you are having other issues, feel free to send a ticket to our support team (support@pluralsight.com) with a link to your project on GitHub and we'd be happy to take a look!